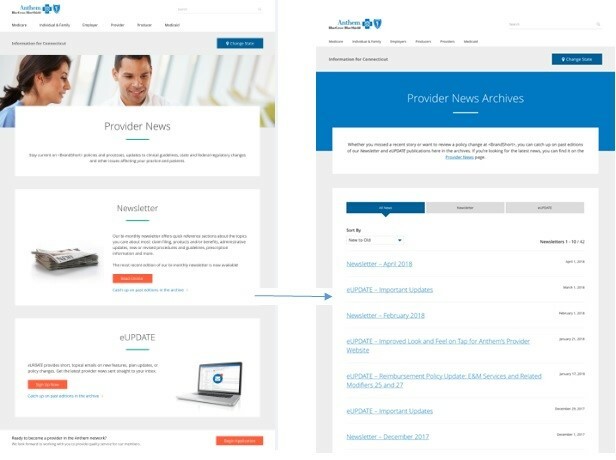 Continuing to build on the initial launch of the new public provider pages, Anthem Blue Cross and Blue Shield (Anthem) recently released a brand new, redesigned landing page for Provider Resources. The most recent release also includes a new Communications page with a clear and concise access point for Newsletters and eUpdates, as pictured below. This October, anthem.com will be introducing exciting changes to the public provider site. Coming in the next wave of changes, providers can anticipate a new landing page for manuals and an improved, streamlined experience for Reimbursement Policies. We will continue to keep you informed on upcoming changes to the public provider site as we progress toward streamlining our web platform and other business processes.